Natural Attars are an ancient form of perfumery that can have profound emotional benefits for the fortunate ones who wear them. Most aromatherapy uses steam distilled essential oils. Plant materials are infused with steam to extract the aromatic oils. Steam, being very hot, tends to abuse the delicate top notes in an aromatic fragrance. While the oil can still be useful for aromatherapy, it may not work so well for perfumery. Our feel of smell like a magnet we are attracted to plants such as perfumed roses. The peppery herb Rosmarinus officinalis uplifts the senses and excites the taste buds. It is easily farmed in a pot out-of-door, leaves growns only to be released by touch or the heat of the sun. Of all the floras and plants on the Earth, only about one per cent holds essential oils. Humans have delighted a special relationship with these species since ancientness, and we have used such plants for fragrances, incense and medications. 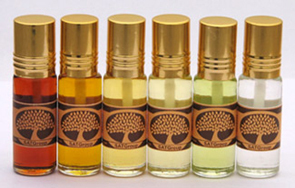 Aromatherapy relies on essential oils to accomplish gentle, nourishing effects on body and brain. The oils are employed on the skin, in the bath and through with inhalation to boost emotional well being. Modern fragrances constitutes of synthetic molecules which are created in laboratory Natural Attars, on the other hand, are made using a process called hydro distillation. As Hydro distillation protects the fragile aromatic oils better than does steam distillation which preserves the freshness of the flower at its natural way, but it is not possible to extract all the fragrance oil with hydro distillation. Making of attars involves, Picking of fresh flowers at its specified time like jasmine in evening time and rose in early morning time, flowers are then kept in copper vessel and stills over an open fire, where they are gently heated & simmered in water using low heat and pressure. The aromatic oils rises in the steam, and are then collected in a vessel of sandalwood oil or other carrier oil which is having similar characteristic . This process is repeated daily for up to two weeks. Scientific search proves that flowers and plants have a healthful affect on state of mind and emotions. Rutgers University's behavioral studies have proven that flowers allow a simple way to improve emotional wellness. Gives clarity to life's purpose and vocation. Brings harmony to the body, heart and mind. Eases emotional and psychological pain while fostering spiritual growth and understanding. Essential oils are extracted from flowers , herbs, bark, fruit and spices by either steam distillation, dissolving in solvents or by simple pressure. They have been called the lifeblood of plants' containing their healing properties in a very concentrated form. Aromatherapy is a holistic method of healing based on the skilful use of pure essential oils which stimulate the natural regenerative processes of the body. Ancient Egypt, China, Greece and Rome used them as perfumes , in cosmetics preparations, incense and medicines. Today essential oils are collected from all over the world and science is confirming their usefulness . They can be used to treat a broad spectrum of conditions including physical , mental and psychosomatic stress problems, Research has shown that smelling them alone has the power to alter one's state of mind . Orange flower is a wonderful remedy for anxiety , worry or insomnia ; Rose is soothing for stress and depression and can alleviate hangovers; Basil , Rosemary and Patchouli stimulate mental clarity, concentration and memory.